I grew up in Music Education... ask me about it! Hello! My name is Chris, and I'm the previous owner of Robinson Music. I'm very excited to have joined the Music and Arts team through this recent merger of family businesses! I have over ten years experience in Music Business. Because of my long time association with the Central Mass Musical Community I have several relationships with educators and private instructors in the area. These relationships assist me in making your choices easier when it comes to buying the right instrument, musical accessories, and method books to help further your musical careers and experiences. I'm primarily a brass player, playing French Horn in both my High School and College Concert bands. I also played trumpet in the Jazz Band. I've always enjoyed playing the Piano...really since I was kid. I picked up guitar when I was about sixteen years old and I really haven't put it down since. When I'm not here, I like to play the piano or acoustic guitar with my children and friends. I was lucky enough to grow up in a very musical home. My father was the Director of Music in Shrewsbury for over thirty years. My mother is a singer and is a string technician here with Music & Arts! I really enjoy listening and playing all kinds of music from jazz to classical from rock to modern day pop music. 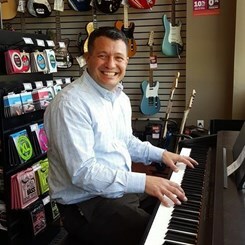 Please come to the store and feel free to chat with me about any questions you may have on products or music, band and string instruments, the importance of a music education and music lessons, the best way to take care of your instruments, or the thousands of new products now in this location.